Teeth and molars can be missing due to an accident, tooth decay and/or inflammation of the gums and surrounding supporting tissue; one or more teeth and molars may also be missing. An implant, crown, bridge or denture can be a solution. 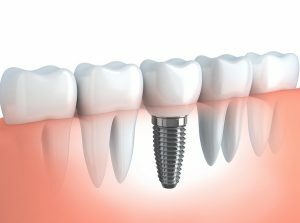 Implant: an artificial root, which is placed in the jawbone and serves as a replacement for a real tooth root and provides a grip. Implants are made of titanium and look like “cylinders” or “screws”. Implants are small, and about as big as a natural tooth root. A crown: If a tooth or molar is missing, an implant can be placed in the resulting space. The implant will have a crown later. This treatment offers the great advantage that the neighbouring teeth remain intact. A bridge: If multiple teeth are missing, a bridge or partial prosthesis (frame or plate) could be made. However, wearing a frame or plate is often experienced as bothersome, and an implant could be an attractive alternative. We use the Sirona Cerec (a 3D scanner and grinding machine) for making crowns and bridges. This device is able to scan your teeth and make a crown or bridge in a short time. This allows us to offer you fast treatment with unparalleled precision. With this extremely modern device even a conventional print is no longer necessary, which provides more comfort for you! A denture: If most or all of the teeth are missing, a denture can be a solution. Dentures can be partial or complete. In principle, the dentures lie loose on the oral tissue; through saliva, the plastic sticks to the tissue. The oral muscles help to achieve a good grip. However, the prosthesis can be annoying, which can cause an unpleasant feeling in the mouth. As a result, more and more implants are being used nowadays.